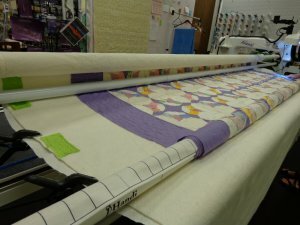 Quilting Services Have us do the quilting for you We offer both an all over meander in various sizes as well as custom quilting. Please call to schedule a consultation with Cindy, our long arm specialist. Rental times for using our Handi Quilter Forte Machine are available during our regular business hours. Reservations are required at least 1 week in advance. To ensure your experience is successful, we require that every renter be certified on the machine before quilting. This $30 class teaches set-up, loading and basic operation. Generally the class is offered 11:00-1:00 the third Monday of the month, but please see our calendar for specific details. The class and any rental time does not include use of the Pro-Stitcher equipment. You may use the rental form in the link above for more renting details.